The tragic fire catastrophe of the Grenfell Tower in London directed the public attention towards building envelopes. The discussion concerning the safety of facades and insulation material is a challenge especially for manufacturers of EPS, says Oliver Kutsch, CEO of the market research company Ceresana: “Expandable polystyrene is mainly used by the construction industry for thermal or sound insulation.” For the third time already, Ceresana analyzed the global market for this light and solid foam material made of expandable polystyrene that can take on almost any shape: Worldwide, about 6.7 million tonnes of EPS were consumed in 2016. EPS is also used for helmets and life jackets, beverage cups, packaging, casting molds, and numerous other products – however, construction products currently account for almost 59% of the EPS market. In the past years, this sector profited from efforts concerning climate protection and public support measures to increase energy efficiency especially in Europe. All around the world EPS-based products are used in the construction of new residential buildings and in the refurbishment of old buildings. Besides fire safety, questions arise regarding the use of possibly unhealthy additives and the environmentally friendly disposal of the practical material after use. For example, glass and stone wool but also insulation material based on renewable resources compete with EPS. According to the latest, completely updated edition of the EPS market report, Asia-Pacific accounted for 56% of the global demand in 2016. Due to above-average growth rates, Ceresana expects demand for EPS in this region to increase to over 5 million tonnes. The development of the Chinese construction sector slowed down considerably, however, demand for packaging is constant. Packaging, e.g. for transportation of fresh fish or electronic devices, accounted for more than one third of EPS demand worldwide. In Asia-Pacific and American countries in particular, EPS products are accounting for a significant share of total demand. Per capita consumption of packaging and other EPS products is still rising especially in emerging and developing countries. Chapter 1 provides a thorough presentation and analysis of the global market for EPS – including forecasts up to 2024: Development of demand, revenues, and production is analyzed for each individual region. Chapter 2 examines the 25 most important national EPS markets individually. Besides 7 EU states, the USA, China, and Japan, these also include Russia, Malaysia, Taiwan, and South Africa. Chapter 3 analyzes the application areas of EPS. The segments packaging, construction, leisure, medical, and sports products, and special applications are treated. Chapter 4 provides useful company profiles of the largest producers of EPS – clearly arranged according to contact details, turnover, profit, product range, production sites, capacities, and profile summary. In-depth profiles of 48 producers are given, including Alpek., BASF, Flint Hills, Loyal, Ming Dih, Nova Chemicals, SIBUR, Sunpor, SPL, Synthos, and Wuxi Xingda. Ceresana is an internationally leading market research and consulting company for the industry. For 15 years, Ceresana has been supplying several thousand customers from 60 countries with up-to-date market intelligence. Extensive market knowledge creates new prospects for strategic and operational decisions. Ceresana’s clients profit from implementation-oriented consulting services, tailor-made single-client studies and more than 100 independent multi-client market studies. 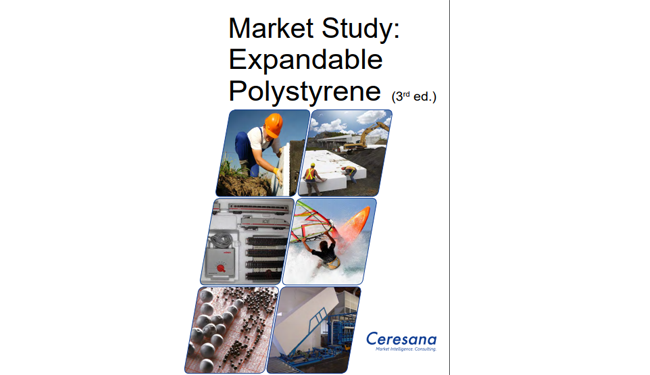 Ceresana’s analysts are experts in the following markets: chemicals, plastics, industrial goods, and packaging.